I have had the luck of getting my hands on one of these babies albeit just for a short while as it was on transit to some rich fella in Taiwan. Now, we are all familiar with Chivas Regal blended Scotch whisky. Royal Salute was created to commemorate the coronation of Queen Elizabeth II back in 1953 and the regular version (a step up from regular Chivas Regal 12 and 18 years respectively) is a 21 year or older whisky. 2003 was the 50th anniversary of that coronation and although it wasn't the same whisky that they have kept for 50 years, the blended whisky nevertheless all came from Chivas Brothers' best stock of 40 years and older. 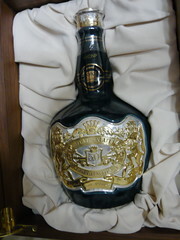 I was there when they launched the bottle in Spitland, originally priced at USD 10,000.00, it was offered at a promotional rate of USD 8,888.00 back then. There were only 255 bottles in the world, of which Bottle #1 was presented to Sir Edmund Hillary whom himself conquered Mount Everest just days before the coronation 50 years ago. Spitland was allocated quite a few bottles apparently due to the crazy noveau rich who would buy just about anything and everything expensive. So, 5 years later, I am holding a bottle in my very own hands. The front label is made of 24k Gold and Silver even which, is probably still a fraction of what the total cost. If I drop it, I will have to sell backside for the rest of my life. Last I heard, the value of the bottle has appreciated to NTD 500,000.00 which converts to about USD 16,400.00 now. p.s. I wonder if anyone would ever open it to drink, given that it cost a bloody bomb and there is a very limited supply of it. If the answer is no, then for all you know, it is only Ribena inside and no one would ever be the wiser. Alcohol!!! Wah, the price cost more than the current price of having tea with Alan Greenspan.. expensive... 喝不下去..
THB: You don't like that lah..... we go drinking when I come back ai mai? if only you dropped the bottle. i would buy your backside anytime babehhhh! wakkaka. Hiyoh. Every sip of that thing you take will be equivalent to.... drinking a handphone. JY: And a good HP at that!! i got a stash 2 large boxes of Cognacs, Armagnacs and whatsnot that i recovered recently and trying to sell away. But guess what i found?? Any idea what the above 5 bottles are? LittleCartNoodles: ... and you wonder why there are cans of Sprite next to it? Aloe: Yeah, most of the premium spirits come with a very nice box. The 25-yr old Glenmorangie that I had also had a nice box. DPL: Yes, Alfred Dunhill has whiskies too but they didn't do it themselves. It is sub-con job to J&B of the famed J&B whisky. J&B also have brands like Caol Ila, Johnnie Walker as well as Talisker under its umbrella. I am an original owner of one of seven of the above which came to the U.S. I have all original documentation & packaging material. I am interested in selling this to a private buyer or to have it auctioned off. Steven: Hi steven, I don't have anyone I know at the moment who is interested. will keep a lookout though. Hello. I found your blog while searching for information on a bottle of 21 year old Royal Salute we acquired from my boyfriend's grandfather to recently passed away. He lived in Georgia, and was quite wealthy. He would buy boxes upon boxes of alcohol and store them in his basement. We found a box of 21 year old Royal Salute Whisky bottles.. These bottles are at least 30 years old today... but I haven't found any other information on them. Would you know anything about them by any chance???? ericanicole234: Welcome to the blog. 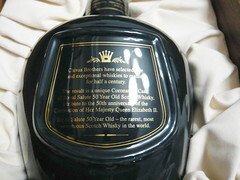 The Royal Salute by default are all aged 21 years with the exception of the limited edition collectibles. What you have on your hands may be the premium "models" of the Chivas Blended Scotch Whiskies but they are not going to appreciate in value over time as they are, at the end of the day, still of commodity stature. Cognacs and brandies on the other hand, do get better over time but for your current stash of Royal Salutes, I say open them and enjoy. Hi My friend! I want to own one of them, how much will you hand it to me. please tell me how much you want for it. Binh: Hi. I don't have it anymore. Sorry. Sir James: Hi there and welcome to the blog. 1953 vintage is way beyond my league. You'd probably need to find someone else who is more knowledgeable than I. Or perhaps put it up on ebay and see what happens?